NEW AS OF 04/27/2012 - All sight gauge kits ship with a 1/2" Outer diameter sight tube. Welded sight gauge for your keg, hot liquor tank kettle, or brew pot. 1/2" NPT pipe thread connections. . Stainless fittings. Stainless eye bolt to stabilize at top of the kettle. 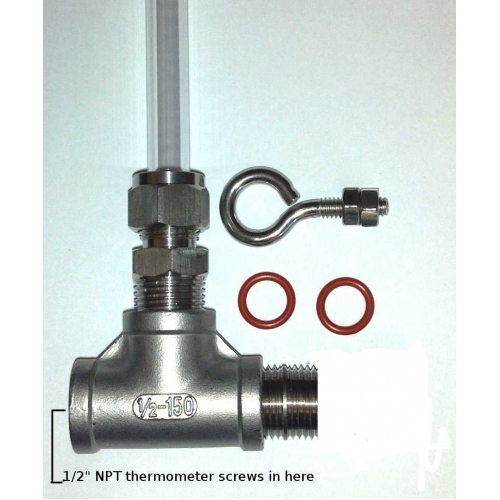 17" Long 1/2" outer diameter high temp poloycarbonate sight tube. PROTECT YOUR TUBING and sight gauge from direct flame exaust. Tubing will soften / melt if flame wash heats it past 250 F.
Liquid will boil if you do not shield the fittings. A HEAT SHIELD (a piece of flat metal under the edge of your kettle) should be used to keep the flames off the sight gauge, valves and thermometers. To remove debris, a short soak in powdered brewery wash or oxyclean and a gentle scrub with a nylon tube brush.